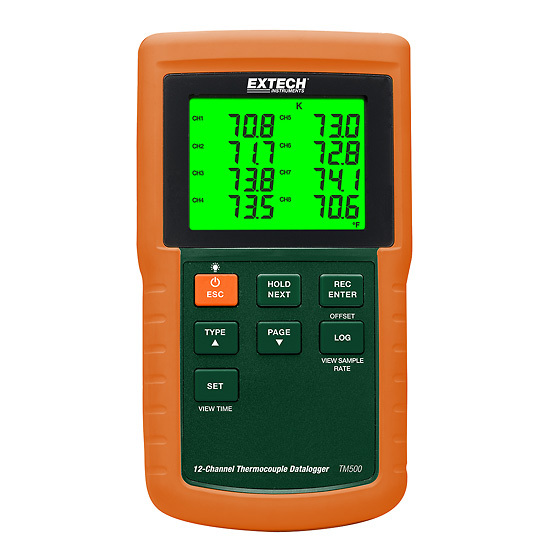 The TM500 is a 12-Channel Datalogging Thermometer. This Datalogging Thermometer features 6 Thermocouple Types (J, K, E, T, R, S). Displays CH1 to CH8 or CH9 to CH12 on screen, data can be recorded from all 12 channels simultaneously onto an SD card in Excel format for further analysis. Complete with 8 AA batteries, 12 general purpose Type K bead wire temperature probes, SD card, and hard carrying case.